Gneiss (/ˈnaɪs/) is a common and widely distributed type of metamorphic rock. Gneiss is formed by high temperature and high-pressure metamorphic processes acting on formations composed of igneous or sedimentary rocks. Orthogneiss is gneiss derived from igneous rock (such as granite). Paragneiss is gneiss derived from sedimentary rock (such as sandstone). 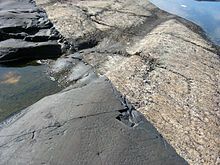 Gneiss forms at higher temperatures and pressures than schist. Gneiss nearly always shows a banded texture characterized by alternating darker and lighter colored bands and without a distinct foliation. The word gneiss has been used in English since at least 1757. It is borrowed from the German word Gneis, formerly also spelled Gneiss, which is probably derived from the Middle High German noun gneist "spark" (so called because the rock glitters). Gneiss is formed from sedimentary or igneous rock exposed to temperatures greater than 320°C and relatively high pressure. Gneiss appears to be striped in bands like parallel lines in shape, called gneissic banding. The banding is developed under high temperature and pressure conditions. The minerals are arranged into layers that appear as bands in cross section. The appearance of layers, called 'compositional banding', occurs because the layers, or bands, are of different composition. The darker bands have relatively more mafic minerals (those containing more magnesium and iron). The lighter bands contain relatively more felsic minerals (silicate minerals, containing more of the lighter elements, such as silicon, oxygen, aluminium, sodium, and potassium). ^ Harper, Online Etym. Dict., "gneiss"
^ Sacks & Secor (1990). ^ Gillen (2003), p. 44. ^ McKirdy et al. (2007), p. 95. Blatt, Harvey and Robert J. Tracy (1996). Petrology: Igneous, Sedimentary and Metamorphic, 2nd ed. Freeman, pp. 359–65. ISBN 0-7167-2438-3. Sacks, Paul E. and Donald T. Secor (1990). "Kinematics of Late Paleozoic continental collision between Laurentia and Gondwana". Science, 250 (4988): 1702–05. doi:10.1126/science.250.4988.1702. "Gneiss" . Encyclopædia Britannica (11th ed.). 1911. "Gneiss" . New International Encyclopedia. 1906.